Let's brighten your Sunday with a signature dish from the hotel's top chef! Blend the cream and foie gras, bring to boil, season and cool down. Bake the potatoes with their skin in the oven on a bed of salt until soft. Open in half and remove the pulp. In a pot, boil cream, add potato pulp and stir. Slowly add butter and keep stirring until become a smooth paste. Then add truffle and truffle oil and season with salt and pepper. - In a deep dish, place one spoon of potato in the middle, then foie gras cream around and finish with the egg on the top. Cover with aluminium foil and bake in the oven in a bain-marie for 11 mins at 180oC. Garnish with shaved baby vegetables and cubes of foie gras terrine. 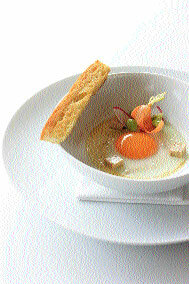 You can sample the dish at JW Marriott Ha Noi, 8 Do Duc Duc Rd, Me Tri Dist, South Tu Liem, Ha Noi. Tel: +84 4 3833 5588 ext 172.